Whilst both political parties profess to not only not cut the NHS budget but to increase spending over the coming years. The fact is that the NHS budget under the Labour government has grown to a level that risks bankrupting the country. In nominal terms the budget has increased from £37 billion in 1997 to approx £120 billion for 2009, a more than tripling of the budget. However a more accurate measure of the increase of the budget is as a percentage of Gross Domestic Product (GDP), in this regard the NHS has grown from 6% of GDP in 1997 to 10% of GDP now, therefore Britain is paying 66% more in NHS spending as a proportion of the economy will little improvement in service delivery due to a near continuous fall in productivity. This and other rampant out of control public spending under the Labour government risks bankrupting Britain as the ANNUAL budget deficit now exceeds 14% of GDP (£180 billion) which requires urgent action to prevent igniting an inflationary debt interest spiral i.e. where the interest paid on accrued debt results in a mushrooming of the countries total debt burden that tips the economy towards an hyperinflationary price spiral economic collapse as the following graphic illustrates. Therefore both major political parties are lying to the electorate when they state that the NHS budget will not only not be cut but increase spending over the coming years. So far only Labour has actually released their NHS spending plans which show an increase of £3.7 billion / 3% per year for the next 3 years, whilst the Conservatives have pledged to match Labour NHS spending plans. The next government will have NO CHOICE but to cut NHS spending, as the Labour party current plan for cutting the annual budget deficit by £23 billion a year just do not stand up to scrutiny as it would still result in the budget deficit expanding by £510 billion over the next 5 years, i.e. to more than 114% of Public Sector Net Debt which the financial markets would NOT tolerate, i.e. it would result in a series of bond market auction failures, which would be countered with accelerating money printing to monetize the debt which would culminate in an Iceland style currency collapse as foreign investors panic to preserve the value of their capital by selling out of sterling in favour of other currencies. The Labour government despite tripling the NHS budget / GP Pay over the past 10 years to £120 billion ($198 billion) has resulted in a continuous fall in productivity over the past 6 years or so, and is only now in the final few months of its government for electioneering making announcements to implement reforms necessary to drag the NHS into the 21st century with a view to putting the patient first for the first time since its creation. The NHS in its present form is a funding black hole with falling productivity that is sucking in ever increasing amounts of cash in real terms. Real reforms are urgently required otherwise Britain will be heading for a health service crisis as the GDP share of health spending continues to expand from 3.5% in 1948 to 10% today to above 13% by 2020, all without any real improvement in patient healthcare. The reason why politicians are lying about cuts to the NHS budget of at least 4% is because over 1.2 million Brit's ride the NHS gravy train and hence have a vested interest in the continuance of this sacred cow funding black hole that continues to exert a sizeable political force that political parties have little choice but to pander towards to ensure electoral success. How could this happen, unfortunately this was as a consequence of the now infamous GP contracts where to be blunt greedy GP's hoodwinked gullible incompetent Labour government health ministers into signing upto contracts which were meant to deliver greater value for money for the tax payer but were designed to do the opposite and resulted in GP's pay doubling whilst at the same time cutting back on hours worked. This was not only a total fiasco for the nations health and finances but also ignited jealousy amongst MP's that directly led to the adoption of the policy of claiming expenses to the maximum so as to fill the ever widening gap between MP's and NHS GP's, as MP's could NOT get away with awarding themselves pay hikes of 30% per annum without losing their seats at the next general election in response to voter outcry, therefore across the board systematic abuse of expenses started to take place which basically means real average MP pay is currently approx £98,000 per annum. The NHS has become so unproductive, that a cut of 4% would be have little cut on the actual performance of the NHS as all that is required is competent management of the NHS so that those employed by the NHS performed more efficiently. The cut in the NHS budget could be coupled with market reforms such as those already announced for GP practices that proposes to allow patients real choice of GP for the first time. If money walked with the patient then that would ensure that the patient receives competent healthcare, as under the current system there exists little if no incentive to put the patient first which is borne out time and time again in analysis, reports and polling amongst NHS frontline staff. The current system is designed to to yield the most money for the least amount of work as we have witnessed with the GP contracts. Therefore a form of health insurance / credit card system MUST be implemented where the Patient CHOOSES which hospital or GP surgery to PURCHASE healthcare from regardless of whether it be a government run NHS institution or a privately run hospital as analysis consistently suggests there exists a huge discrepancy in the quality of GP services between affluent areas of the country and deprived areas which has contributed to a 20 year gap in life expectancy (UK Swine Flu Pandemic NHS Online Service to Bypass Inept GP Surgeries), only then will the patient come first and receive the treatment that they deserve rather than the current half way house that costs more and repeatedly fails to deliver the price of which is unnecessary illness and early deaths. The data compiled by the Department of Health funded UK GP Patient Survey conducted by Ipsos MORI during early 2009 that sent out a questionnaire to 5.7 million NHS GP patients and therefore comprises the most comprehensive data available as to patient feedback of actual experience of using GP Services. In total 57,759 questionnaires were sent out to Sheffield patients of which 24,696 were returned or 42.75% (click here for a sample survey). Whilst the questionnaire contained many fields, however the most relevant fields towards the rating of Sheffield's GP Surgeries is the level of overall patient satisfaction with the quality of healthcare at the GP surgeries for all of the 91 Sheffield GP surgeries in order of most overall satisfaction experienced. Out of the full list of 91, the follow represent the bottom 10 performing GP surgeries as per the Patient Survey that could be singled out to be cut or if a real patient choice system were implemented would be expected to lose their patients to better run more cost effective GP surgeries, therefore resulting in both saving costs and for greater patient satisfaction. That is very true. But You can get always get a full medical coverage at the lowest price from http:// if you do your home work you can find the best plan. My family's experience of the NHS has been truly awful. Negligent treatment for a child's joint infection leading to numerous operations, chronic pain and arthritis at the tender age of 16. The hospital involved, Kingston, covered up the negligence by pretending that the complications were due to something other than their crappy treatment. The cover-up was continued when we insisted on a second opinion which obviously wasn't independent. When we tried to take legal action, the medical expert witnesses lied in their reports so that we had no case! This is despite very basic errors of the type that a second year medical student would know about. The old boys' network is alive and kicking in the medical profession - it really is like the mafia. The lawyers know what is going on but let them get away with it as they get paid anyway so don't really care what compensation the injured patient gets. Also, it is so hard to complain as you are having to fight against such a well-established, fairly corrupt system which has built very hall walls around it. The patient really does seem to come at the bottom of the heap - there is no proper advocacy body for the patient and short of voting in a new government, how can patients really effect any changes? It's not like you can vote in a new board of directors or something. When anything goes wrong (as it often does because there is so little quality control) it is all whitewash and a cover-up. The complaints system is no better with hospital trusts doing all they can to bury any evidence of malpractice. Is this really how we want to see our hard-earned money being spent? Until there is better quality control, accountability and patient power, with the patient being put back into the heart of the service, the NHS will continue to offer a third world service. (However, if you have money or connections, you can work the system and access good healthcare - so it is not true that the NHS offers an equal service for all. It most certainly does not.) I think we should scrap a state-funded healthcare system and look at European style systems which seems to offer much better health care. The NHS really is crap Jenny. My wife has been caring for an elderly lady for years, and is her designated next of kin. This lady needed cateracts removed, but Burnley General messed up big time and she ended up with ulcers behind one eye, and damaged the cornea of the other. We could not prove anything at this point. The negligence of the orthopedic doctor and nursing staff has been unbelievable. The doctor withdrew one of her eye medications, without asking her private consultant, which has resulted in the ulcers returning. Her other medications one of which is an anti rejection drug have not been administered correctly and her other eye has deteriorated terribly. My wife made a formal complaint, and what has subsequently happened, you could not make up. The day after the complaint went in, they informed my wife that they were discharging the lady to rehab for her hip. her social worker said no, as she could not find her anywhere at such short notice, and in any case she could not put full weight on her hip. The next day they said she could put full weight on it, the doctor had forgotten to put it in her notes. My wife found her a place at a BUPA home for rehab as she does not trust an ordinary place to treat the elderly lady correctly, and informed the social worker. Within two hours the social worker had found her a county council home. This was not acceptable to my wife, and the fun then really began. Firstly the Chief executive wrote and told my wife that no information would be given to her about the lady's treatment unless she obtained written consent from her, despite my wife being next of kin. Secondly the discharge manager and a physiotherapist with the connivance of the social worker, began to browbeat the lady not to go private, this is continuing. Thirdly the discharge manager told my wife that the private home had phoned to say they did not have a rehab bed. I phoned the home manager who said she was lying, that she had phoned the hospital to inform them that she was sending two nurses to assess the lady's needs, and they had told her that the lady was being sent home with a rehab package. The very same day they had told my wife that she was going to the county council home. They are scared witless of her going in a private home, as they are fully aware that her private consultant is to visit her. The people at this hospital are lying through their teeth to cover their mess up. My solicitors are now involved but warn of a long hard battle. Needless to say this hospital despise my wife. 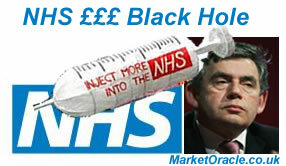 Really to say the NHS is crap is an understatement, it is downright bloody lethal. I will never again use it. GP's operate like dinosaurs from a different era. 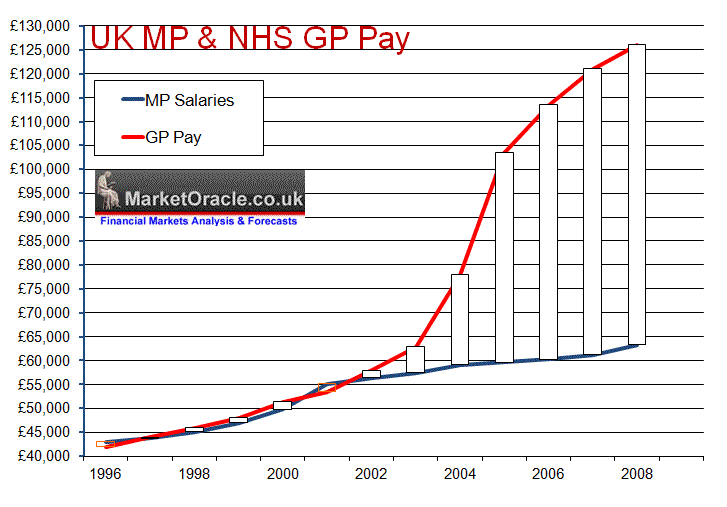 They are paid huge sums to simply write prescriptions or refer on patients to more highly skilled doctors. Much of what they do could be provided by nurses at a fraction of the cost. Time for some radical reform. More money for less work for, those collectively, already in one of the best paid jobs in the country? This is a stand-out example of Labour's incompetence in managing public services. A worse service - and contracted-in staff on something like £100K+ p.a. Why are GPs still contracted to the NHS, with massive bargaining power which ran rings round government negotiators, 60 years after the inception of the NHS? This should be a directly employed specialisation in NHS owned and run clinics, manned as required - and offering 24/7 cover. Follow the Australian GP model,Medibank.The patient can visit any doctor they like, who receives a specified fee for a particular service. This is real patient power, if the doctor is not very good they do not make much money. The BMA is simply a powerful union protecting the vested interests of its members not the patients. Labour has made incompetence, bad decisions, waste and appalling results the standard, in every area of government. This is standard Labour with good value and proper service irrelevant. Overpaying to buy silence and votes is vital. Insiders report only one part of any government department has been modernised, the PR section. Staffed by labour fanatics, paid first by Labour, now by the taxpayer. They have monthly 'bring out bad news days', to bury Labour bad news when the media is distracted. No surprise as Labour say one thing, but do whatever buys votes. Competence, law, good policies, value for money, and proper services all irrelevant. Labour have buried the UK under finacial recession, social depression and immorality. They see the State as a gravy train for their benefit, not for the poor and disadvantaged, who are political slogans. They remail as they were in 1997. Labour's core vote. Brown's cynical removal of the 10 pence rate showed he wanted the poor more dependent on the State, and middle earners get a tax break. I think it's fair to say that GPs. have doubled their pay in real terms since Labour came to power, while doing less work with their refusal to assume responsiblity for out of hours calls. Effectively their productivity has decreased. As an office worker I have not seen my GP in fifteen years. Reason - he/she is never available at a time that suits me.